Your toddler will only eat pureed food. Your son will only eat crunchy foods like hard pretzels, celery, and chips. Your daughter calls any food wetter than a cracker "slimy." 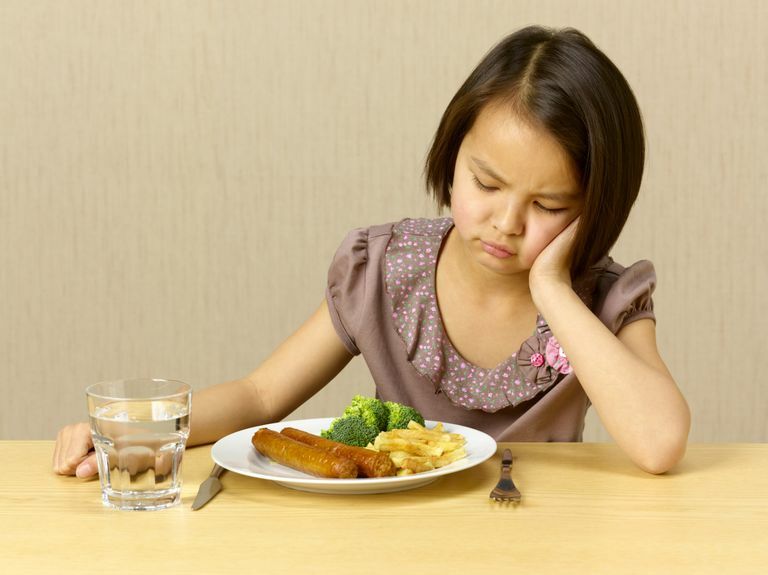 Are your kids picky eaters or could they have a hidden medical problem? Yes, in some cases this may just be picky eating (lots of us have food preferences, and mixing them into a toddler-parent relationship is an easy recipe for power struggles). But if your child limits himself exclusively to certain textures of foods and refuses to eat others, it may be a sign of a sensory processing disorder (SPD). Your pediatrician can help you determine whether a very picky eater actually should be evaluated for the condition. Sensory processing disorder is a condition that leads you to over-react to stimuli in your environment. The stimuli can involve any of your five senses, including taste, smell, touch, sight, and hearing. When a child (or an adult) has sensory processing disorder, they may seem to have out-sized reactions to what you'd consider "normal" inputs to your five senses. For example, many people with sensory processing disorder cannot handle loud noises, like thunder or fireworks. Researchers believe the problem in sensory processing disorder involves differences in how the brain handles sensory inputs. These inputs, in some people, overload their brains and cause over-reactions to "normal" sights, tastes, smells, and sensations. Children with sensory processing disorder have a difficult time making sense of the sensory information that their body collects. This makes it difficult or impossible for the child to respond normally to external stimuli, such as food with a particular texture. In practice, these children may gag if forced to eat food with the problematic texture, and they'll likely refuse it if they can. The texture that triggers this aversion could be crunchy, slimy, near-liquid or something else. Sensory processing disorder can cause a variety of other symptoms. For example, some children may be overresponsive—averse to being touched, tormented by tags in clothing, and unwilling to touch textures they find distasteful. Others may be underresponsive—oblivious to pain or their proximity to others and constantly seeking out more sensory input. These children may only like very hot or very cold food or only very crunchy or hard-to-chew food. Treatment of sensory processing disorder involves physical and occupational therapy that eventually should help your child become accustomed to more textures and types of food. A trained occupational therapist can evaluate your child’s sensory processing and determine if the food texture aversion is due to the condition. Not every child who has an aversion to a particular food texture actually has sensory processing disorder. For example, if your child will only eat soft food, it may be that he has difficulty chewing and swallowing other foods. This can be due to dental problems such as untreated cavities, pain in the mouth or throat, lack of muscle control, or a physical difference in mouth structure that makes chewing and swallowing difficult. A child who has always been in pain believes that pain is a normal state of being, and will not describe feelings of pain when eating. Children with autism often have rigid rituals around meals that can include refusing to eat certain textures, tastes or temperatures of food. They also are more likely to have a sensory processing disorder. The two conditions are separate but linked. If your child has been diagnosed with sensory processing disorder, work with her therapists on gradually expanding her diet. If you find there's one type of food—for example, crunchy food—that your child likes, see if you can find different types of crunchy food that she'll accept. If you make small changes continually, you may be able to broaden the universe of foods your child will eat. In some cases, however, you may need to consider a more intensive (sometimes hospital-based) feeding program. Also, remember that picky eating can indicate a variety of medical problems beyond sensory processing disorder. For example, some children gag on solid foods, while other children don't want to eat anything at all. If you're not certain of your child's diagnosis or have questions about treatment, talk to your child's pediatrician. Ernsperger, Lori, Ph.D. and Tania Stegen-Hanson, OTR/L. "Just Take a Bite: Easy, Effective Answers to Food Aversions and Eating Challenges." Future Horizons, Arlington, TX.